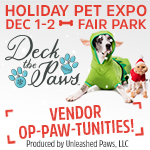 "Deck the Paws is a two-day pet-topia of fun that includes: Holiday shopping for pets and pet lovers, Santa’s village with photo op-paw-tunities with Old Saint Nick, North Texas’ first art exhibit for dogs, Ugly Sweater contest for humans and their pets, Music and other holiday entertainment, Paw-tastic Kids’ Zone, Festive foods and a Beer & Wine Garden, Celebrity pet bowl auction, Free Coat & Package Check, Gift Wrapping, Benefits Artists for Animals, DFW Pup Patrol & Operation Kindness." Admission Fee: pricing and tickets are available here. "The FPC Women's Retreat Committee is proud to present the 8th Annual Christmas Bazaar. Holiday shopping could not be any easier featuring handmade items, jewelry, fresh crop pecans, special gifts and our ever-popular baked goods. Get ready to shop till you drop!"" "Join us for our Annual Christmas Craft Fair at Dottie Lynn Recreation Center. It will be a festive time filled with shopping, goodies and more! Saturday, December 1 will include a performance from Arlington High School Show Choir and a special visit from Santa Claus. Admission is FREE." "Two huge rooms of vendors with unique items in a family friendly atmosphere. Great items for Christmas gifts and all-occasion. Hot breakfast and lunch available for purchase. Raffles held throughout each day on vendor donations. Santa will be here, 1-3 p.m. on Dec. 1st." "Please join us for our 38th Annual Arts and Crafts Show, featuring local handcrafted goods, children and adult's clothing, home decor, Christmas decorations, and much more! Saturday 10a-6p, Sunday 12p-5p. Admission is FREE to the public. For every purchase, customers can enter to win great door prizes, which will be drawn from a raffle at the end of the show." "3rd Annual LTHS Cheer Holiday Market, sponsored by LTHS Cheer Booster Club! Breakfast with Santa, 9am-11am, Free parking and entrance to market. Breakfast is $7 per person (breakfast, picture with Santa, letters, crafts). Market to include jewelry, home goods, food, wellness, clothing crafts and more." "Join us for the 5th Annual Cottonwood Creek Church Christmas Market. 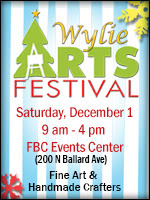 We will have 40+ vendors (handmade, MLM, & Food) PLUS a real Santa! As shoppers follow a specific path through the event, they will pass by each booth. As they proceed through the event, they will gather stickers from various vendors. Additionally, interspersed throughout the booths will be various activities for the kids to participate in. After collecting all 12 vendor stickers, they will be permitted to get in line to see Santa. As an additional incentive, at 4 of the games, the kids will have the opportunity to win a special sticker. After collecting 3 of those special stickers, they can receive a FREE hot cocoa after seeing Santa. There will another separate exit in the same area for those not wanting to see Santa." "Vendors & Crafters alike are invited to share and sell the perfect holiday gifts! We will have homemade items as well as direct sales vendors. Come do your Christmas shopping with local small businesses. This is a free community event and everyone is invited!" "You won’t want to miss this year’s Bake, Craft and Vendor Fair!! We will be featuring various artisans as well as known Direct Sales companies with up to 25 booths! Admission is free and you just may find those unique Christmas gifts you’ve been searching for!"